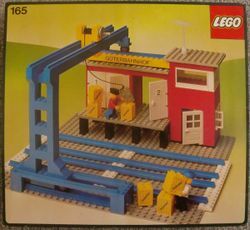 165 Cargo Station is a Trains 4.5V set released in 1978. It contains two Minifigures who work at the cargo station. A crane overhead of the tracks is used to lift cargo to and from the trains. Facts about "165 Cargo Station"
This page was last edited on 12 January 2016, at 06:56.